Thank you for camping with us! We hope you have a very pleasant stay. If you have any questions, please feel free to ask Park Personnel for information or help. Check-in and Check-out time is 2 p.m for Campsites. All Rental Units: Retro Lodges, Cabins, Bungalows & Chalets check-in time is 4 p.m. & check-out is 12 p.m.
Quiet Hours start at 10:30 p.m. Noise including (but not limited to) radios, talking, or vehicles should not be able to be heard on neighboring sites. 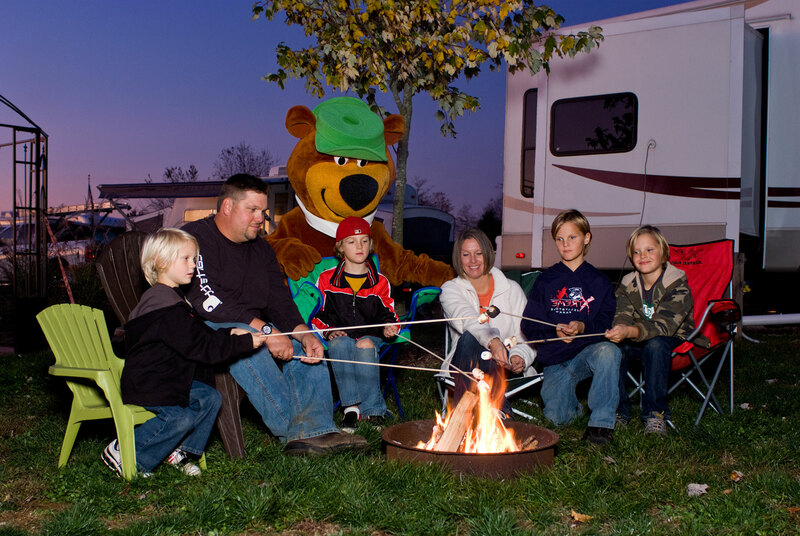 Campfires should never be left alone night or day & must be within single fire ring. Use caution near all fire rings, keeping a safe distance from all fires & never squirt flammables into a burning fire. Fires may be extinguished with security and/or management’s discretion. Fireworks purchased outside of our property are prohibited. Management reserves the right to confiscate any fireworks. State law prohibits disposal of wastewater on the ground, please use dump station located near Site #141 or Site #61 on your map. Living or dead trees are not to be cut, damaged or burned. This includes (but not limited to) limbs, branches, or trunks already on the ground. $100 fine. Bicycles and scooters must have lights to be used after dusk. Please ride responsibly at all times. Personal golf-carts allowed with signed waiver form. Security may be on duty after 10:30 p.m. for your protection, and can be reached by calling 1-608-393-4357. In case of emergency (police, fire, and ambulance) dial 911 from any phone in the park. Please respect other camper’s privacy, please use park roads without cutting through other guest’s site(s). Any violations of any rule may result in eviction with NO REFUND! Garbage should be left at your site post marker and is picked up daily. Two garbage bags are given to you at check-in. One is for recyclables. More are available at Ranger Station & Gate House. Guests with disabilities, Your business is valuable to us. Please let park personnel know how we can assist you! 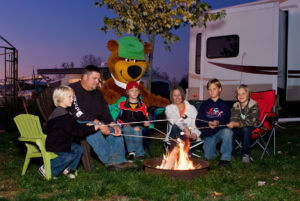 Camping is an outdoor activity, animals and weather are unpredictable. Please secure food before retiring. No Refunds due to inclement weather. Enjoy your stay, Come Back Soon, and remember, Don’t Feed the Bears, & YOGI BEAR™ is NO exception! Jellystone Park™ Set To Open May 10th with Special Activities For Mom! We’ve been camping in jellystone park fo 17 years and we loved it, we tried another park and we are never going to do it again ! !we always go for the 4 of july and something better to improve is the toilets dont have power when you flush them but other then that everything is wonderful !!! Looking forward to continuing camping in yogi bear !! !